Avocet Gelflex saddle gets a new life with a marine vinyl cover. One of the best bike saddles ever made, the Avocet Gelflex, had one drawback: its flimsy nylon cover didn’t last long. Today it’s difficult to find a plain nylon saddle cover to go over the Gelflex, so I checked around and found instructions for using marine vinyl to recover a saddle. The Instructables website “how to” article took me through step by step. It’s a great description, even if I did botch the job. I’ll share my experience here and give some hard-learned advice. First, I purchased the marine vinyl at a local fabric shop. It comes in a set width, which was wide enough for a saddle cover, so all you need to do is buy as much as you need in terms of length. I bought a half-yard in anticipation of doing several saddles. The salesperson knew exactly what I was talking about when I mentioned the vinyl. It’s not expensive. Second, I used a 3M spray glue called Scotch Super 77. It’s an all-purpose adhesive, but maybe isn’t the best spray glue for the job. On reflection I would use a spray that’s meant for “headliner” jobs. Headliner is a car’s ceiling fabric. Glues made for headliners hold up well in heat and adhere better to the kind of fabrics we’re talking about here. Third, follow the directions to the letter. I only sprayed one coat on the second spray session, where the sides are glued down the saddle, when two were called for. The result was that the adhesion wasn’t good where your inner thigh touches the saddle. Fourth, try to make the template as close as possible to the actual size you need. 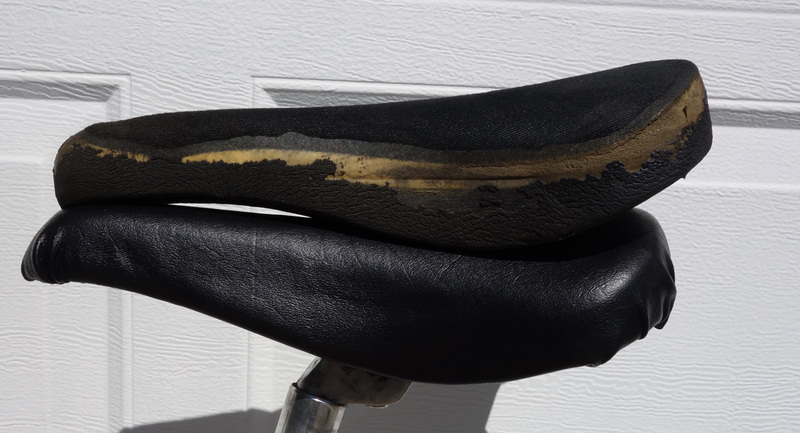 That was a problem with the Gelflex because the saddle cover was almost completely worn away. I had to eyeball it and use the saddle to get an estimate. However, you don’t want to cut the cover too small, because there is no recovery from such a mistake. Fifth, the stapling is difficult. I used a hand stapler that usually only works half the time. Sometimes the staple pierced the saddle, other times it didn’t go far enough. I used a different adhesive to glue down the small sections beneath the saddle. Finally, I had difficulty pulling the vinyl tight so there were no ridges or bumps around the sides. Commercial saddle makers use machines for this step, so don’t expect your saddle will ever come out looking that good. I’ll give it another try with my second Gelflex saddle and hope for better results. The one I have is functional, but it’s hard to say how long it will last. [UPDATE (Oct 4, 2015): The saddle cover is still fully functional. No issues. This entry was posted on March 25, 2015 at 2:15 pm and is filed under Repair. You can follow any responses to this entry through the RSS 2.0 feed. You can leave a response, or trackback from your own site. If you don’t want to go the do-it-yourself route, you might contact Jason at recoveredsaddle.com. A few years ago he recovered an old Selle Italia Turbo of mine and it turned out great. That said, I’m not sure whether he can recover a Gelflex saddle. But it’s worth the cost of an email inquiry to him!